Platinum Play online casino has been the home for a huge number of online Blackjack players since way back in 2004, they are a MicroGaming powered site offering both a downloadable and also an instant play flash powered casino platform. At Platinum Play Casino you will be able to play a massive suite of Blackjack games including both single hand games, multi hand games as well as plenty of classic and graphically enhanced Gold Series variants. There are a total of 2 decks in the shoe on this Bonus Blackjack game. Prefect strategy returns a house edge of a respectable 0.39%. Double Down is permitted on any two cards. The Dealer on this Bonus Blackjack game always Hits soft 17 hands. 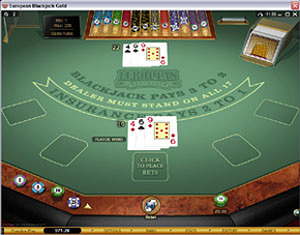 The lowest house edge variant of all Microgaming Blackjack games. Play this game with optimum strategy and the house edge is just 0.13%. You can Double Down on any nine, ten or eleven valued hand. One single deck of cards is in play on this Classic Blackjack game. A range of bonus payouts are awarded for being dealt selected hands. The shoe holds 8 decks of playing cards. Play this game with perfect strategy and the house edge is 0.38%. You can split a hand 3 times which makes a total of four unique hands. The only MicroGaming Blackjack game with a progressive jackpot. A 1.00 obligatory side bet wager must be played alongside your stake. Five decks of standard playing cards are in play in the shoe. The Dealer must always stand his hand on all Soft 17 hands. 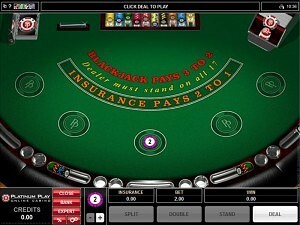 The Minimum stake on this Blackjack game is just 1.00 per hand. A total of two decks of playing cards are in play in the shoe. The house edge is quite a modest one and that is some 0.39%. Players may Double Down on any two cards they have been dealt. You are going to be able to claim 1,500 in free blackjack bets if you opt to give Platinum Play Casino a try, and if all goes well you will be able to keep any winnings you make, checkout their website now for full details.